Oh I love all the pictures of him having fun outside. You guys need to sell up and buy a house with a gigantic back yard, he would love it. You and Jef could build him a massive playhouse...get a slide and swing...a big sand pit (well maybe not, cats like pooing in those things). Having a toddler looks like a lot of hard work. 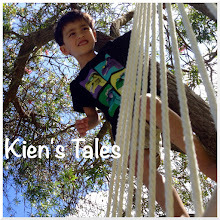 I keep thinking that as Kien reaches every stage, it will be about 11 months until Thomas does as well. So I treasure having your blog to read as it really helps me when I wonder "did Kien do this too? Is it normal?" so I don't feel like I have a strange child. Keep up the good blogging! I love reading it.